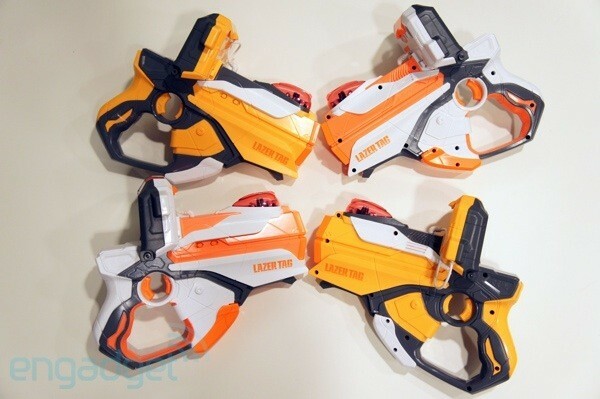 The NERF has been dropped, but Hasbro's Lazer Tag system is still the same awesome toy we got a taste of in February. The difference is, now they're retail ready. Individual blasters, complete with iDevice dock, will hit shelves in just over a week, while packages of two are scheduled for October 1st. The companion iOS app is already available through iTunes, but a rep from Hasbro still describes it as being in beta form (an update is on its way that will remove that tag and simplify the initial set-up). The same rep was also nice enough to swing by the Engadget compound and deliver us a pile of blasters to test ourselves, which we immediately took out for a test run in Washington Square Park. Head on past the break for some impressions and a taste of our "Lazer" battle royale. The hot glue and header pins are gone, but the basic design remains the same. 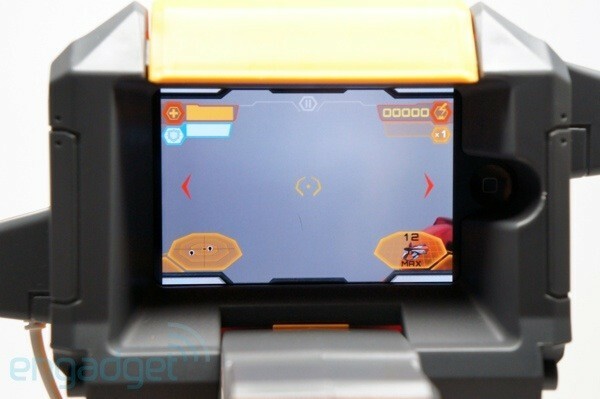 One of the few physical features we had yet to see in action was the device cradle itself. Locking your iPhone into the gun isn't exactly an intuitive process, but once you've done it a few times it becomes much easier. First you need to slip your phone or iPod into a skin to help keep it secure, then connect the audio jack data cable. Then a slightly confusing latch locks the whole thing in place. Again, it's not immediately apparent how the locking mechanism works, but once you figure it out it's not hard to master and it certainly feels secure. From there you fire up the app (and make sure the blaster is turned on) and it's simply a matter of choosing a single- or multi-player game. In single-player mode, you blast drones and aliens that fly around the room in an AR battle. Playing through the single-player games earns you points that unlock and upgrade weapons, special attacks and "hacks," which boost your shields and health. We won't lie, single player mode isn't very compelling for more than a few minutes. The enemy animations aren't the greatest and we found the game to be needlessly difficult -- two days in and we still can't beat the second level. That's ok though, the single-player game is merely practice -- a trial run for the real fun of playing laser tag with other human beings. The app supports up to 24 players either in teams or in a chaotic solo mode with every man or woman fending for themselves. There's few surprises once you get going. Stare into your iPhone and watch as laser blasts pelt your opponents, then run and duck as they lock on to you with their own weapons. The gun will let you know you're in someone's crosshairs by blaring "danger!" This, of-course, makes it quite difficult to sneak up on someone. You could turn down the volume, but doing so is a frustrating experience that requires you to back out of the game and lower the sound effects in the settings menu -- one percentage point at a time. You can't even hold the volume up or down buttons to race through, you'll have to tap the screen 99 times to get from 100 percent to zero. There are three buttons that you'll need to master. The trigger which, obviously enough, fires your weapon; the front trigger which turns on and off your shield and the front grip lever, which reloads your weapon with a tap, or engages the weapon select menu if you hold it down. When you engage your shield your screen turns blue and the gun emits a low pulsing sound, indicating that you can't be harmed but also, that you can not cause harm. As you take damage your iOS HUD will develop virtual cracks and your health meter in the upper left hand corner will decrease. Zap an opponent and you'll be treated to an over the top explosion animation. While the allure here is the augmented reality element, you don't have to feel left out if you don't have an iPhone or iPod touch. The gun and most of its features all work without the need for a smartphone. Press the front lever to change teams and the trigger to select. The one major limitation is you'll only have access to the two default virtual weapons without the app. Single blasters should be on shelves on August 1st for $40, while the package of two will have to wait till fall and will set you back $75.